A new naphthacrown based macrocyclic receptor (1) has been designed for the molecular recognition of fullerenes in toluene. The influences of 1 on the UV-vis spectral characteristics of C60 and C70 have been explained using a theoretical model that takes into account the interaction between electronic subsystems of 1 with fullerenes. Steady state fluorescence experiment elicits efficient quenching of the fluorescence intensity of 1 in presence of both C60 and C70. It is observed that C70-1 system forms an emissive charge transfer state with the appearance of new emission band at 381 nm. 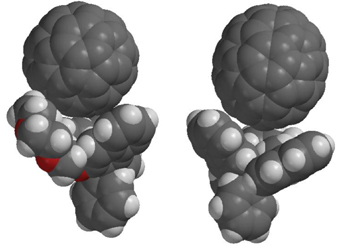 1 binds both C60 and C70 very effectively with binding constants in the range of (6.1 to 7.3) x 104 dm3.mol-1. Lifetime measurements suggest a static quenching mechanism behind the deactivation of photoexcited state of 1 in presence of fullerenes. Both 13C NMR and hybrid density functional calculations establish end-on binding motif of C70 towards 1 during complexation.